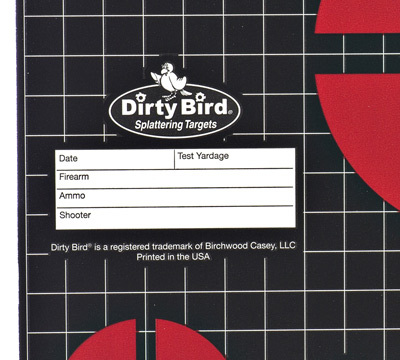 These large Dirty Bird, 12", sight-in targets feature aiming points for open or scoped sights. 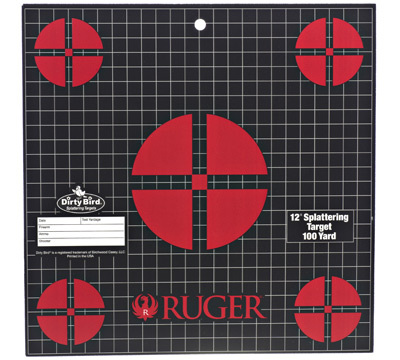 The 100 yard targets have a 1/2" grid pattern and leaves a reactive white, halo ring when the bullet passes through the target. The intense white splatter halo provides for superior down-range contrast. Made of a heavy tag board construction with a non-adhesive back. 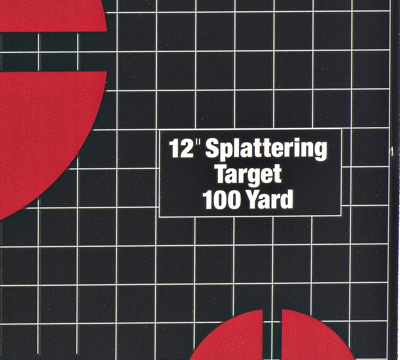 Each target has a space to record date, firearm, ammo, shooter, and yardage information. Set of 10. Made by Birchwood Casey. I had purchased these and some 200 yard targets maybe 1 year ago. Went to restock and they didnt have the self adhesive backs this time. Was little disappointed. The 200 yard targets werent the peel and stick but 100 yard from previous order did. Dont know why they were different this time around. Still a quality target. It is very irritating hearing from people who Obviously have NOT used or purchased the product, such as the first reviewer who claimed it was too costly for only 1 target. If he bought this, he would have know there are 10 targets per package. Please stop reviewing a good product when you obviously didnt buy. It dont make you look cool. I found the targets to function well, and you can find coverup decals for re-use. Its a pack of 10, not 1 target. About a buck apiece, which my local range charges for the equivalent neon orange/white paper version ie not splattering type so, not such a bad price after all. These work great for me shooting 30 cal. and they splatter well and are easy to see at 100 yards with binoculars. I have used these at 25 yards with a .22 cal. pistol with good results. The four small circles are fun once the gun is sighted in.